Where I Write: Palisades Park. I run my hands over the brushed silver metallic letters stamped onto the face of the stone monument, tracing their outline as I write them down, checking to make sure they’re correct. I’m hot, sweaty, even though there’s still a marine layer blanketing the coast. 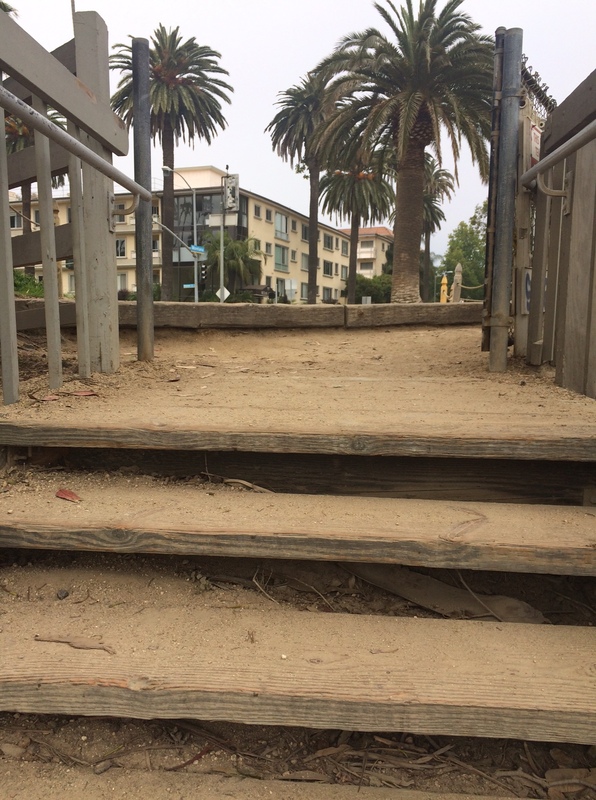 My legs feel strong, yet shaky, the result of running the steep wooden steps from Montana Avenue down to Pacific Coast Highway, up and down, again and again. Music pulsates through my ear buds as I dodge children and tourists and surfer dudes with unwieldy longboards on their way to and from the beach. I take the steps as quickly as I can, because the faster I reach the summit, the sooner the ache that began in my calves and quickly spread, sending fire throughout my legs, rising upward into my chest, causing my heart to pound and my lungs to burn, will cease. On one ascent I count 131 steps, but I’m so focused on moving, on pushing air through my lungs, that it’s anyone’s guess as to whether that number is actually correct. Palisades Park, an ocean front promenade situated on bluffs above Santa Monica’s stretch of Pacific Coast Highway, is one of my favorite places in L.A. And while I come here often, it isn’t one of those places where I find myself comfortably settling into a space with a cup of coffee, allowing the day to stretch out before me like a luxury. Instead, I come here to move, to breathe in the salt air, to feel the blood coursing through my veins, and to think. Like a lot of writers, I have a tendency to get hung up on word count and page numbers, feeling the constant need to produce. But in reality, I believe that creativity is a balancing act between action and reflection, and both are equally important. Whenever I’m feeling stuck, I know I need to get out into the world for a while before I can return to the page. 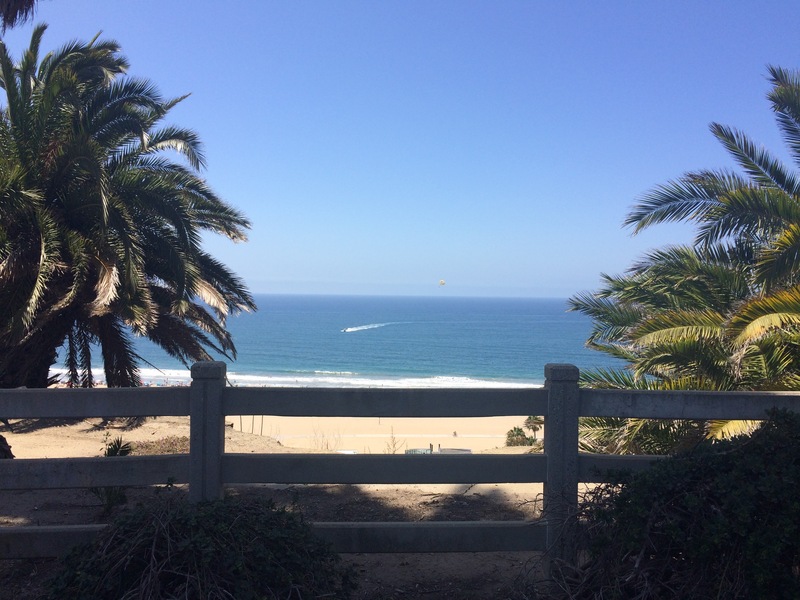 There is amazing people watching to be had at Palisades Park – everything from local yogis to picnicking families to European tourists – but it’s the ocean that draws me here. My whole life, I’ve always felt most at home at the sea, and today is no different. After I finish climbing stairs, I head for the sanctuary of the nearby rose garden, relishing the rush of the wind in my hair, the breeze tickling my face. I select a park bench, unzip my backpack and find my journal. 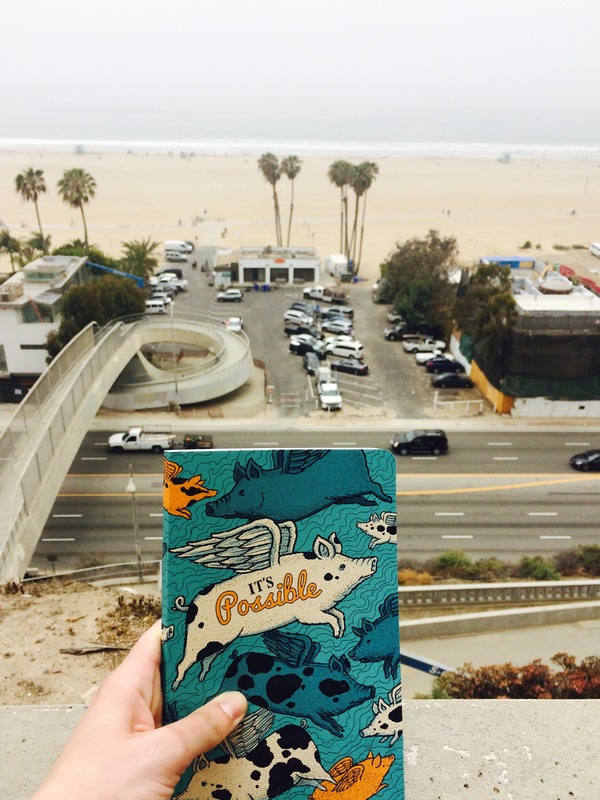 For today’s trip, I’ve chosen a whimsical notebook with flying cartoon pigs and the hopeful mantra “It’s Possible” emblazoned across the cover. I turn my face toward the ocean and before I begin to write, I pause, watching the waves roll and crest and break. My eyes follow the horizon, fixing on the point where the unending expanse of blue melts into the white haze of marine layer, far, far off shore. There are some people who feel small in the presence of the mighty Pacific, but not me. The knowledge that this great ocean is connected to other waterways all over the world and that somehow, some way, I’m connected to them too, makes me feel infinite, makes me feel safe, makes me feel as though anything were possible. I open my notebook and write furiously, jotting down the thoughts swirling through my brain before they’re gone. I remain for only a handful of minutes – as long as I can stand it – until finally, exhausted, hungry, I’m ready to go home. But on my way out of the park, something stops me. It’s the stone structure I’ve passed by so many times, with the words of the famous marine biologist Rachel Carson inscribed among the granite and fragments of abalone shells. Occasionally, I pause to read them, but today, I decide, I will copy them down. I pull out the flying pig notebook once again. As I begin to write, I notice – out of the corner of my eye – a woman approaching me. “No, you’re not the only one,” I smile. She smiles back. And then, just like that, she’s off, waving goodbye as she jogs away. I watch her go; my legs heavy but my heart surprisingly full. And then, I too decide it’s time to go, time to return home, time to take this morning’s scribbles and turn them into something resembling a story. revolution in politics. But it was for PEACE. I just hope this TIME there’s not another four dead in Ohio….where did the dream go? I suppose we’ll have to ask Neal Young. I love this. Inspired me to go find a writing spot other than my bedroom. Do it! I try to find one new place a week. Thank you, Sarah, for this. 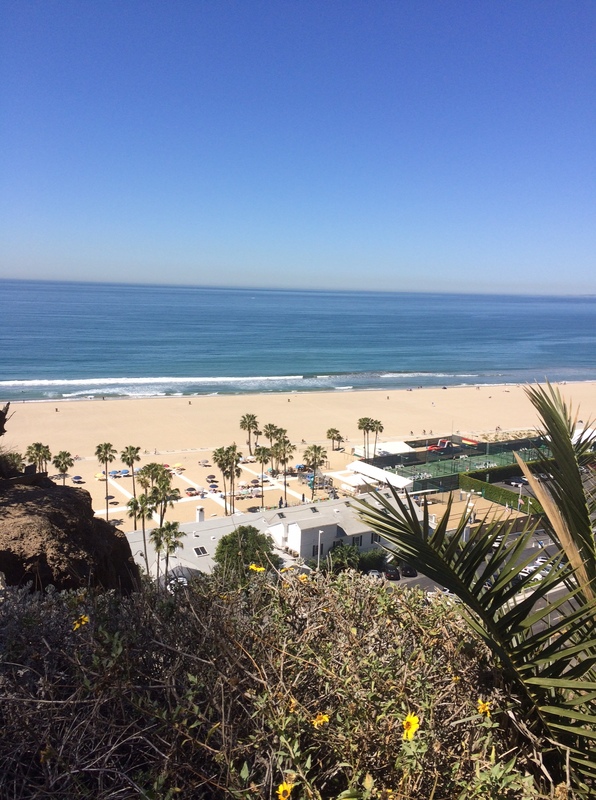 In my younger, fitter, California days I also found solace and inspiration at Palisades Park. How lovely to think of you there, finding your voice. Wait a darn second. I feel a little cliffhung. What did the stone structure say? What did you write down? I love this Karen! Great photo too. Was it taken in Brighton? I spent five months studying in London when I was in college and I went to Brighton several times and loved it there. Thank you for sharing this and reminding me that in a world that often seems fractured, there really is more that unites us than divides us. Have you read Anne Morrow Lindbergh’s A Gift from the Sea? One of my favorites and it’s remarkable how well it has held up over time. Cheers!